Have you seen this floating around social media? Made me laugh out loud as I think it often. Especially during school drop off when I have to bundle 2 kids, park the car and walk Noah, who decides to move like a sloth, to the door. Not cool weather. Not cool. 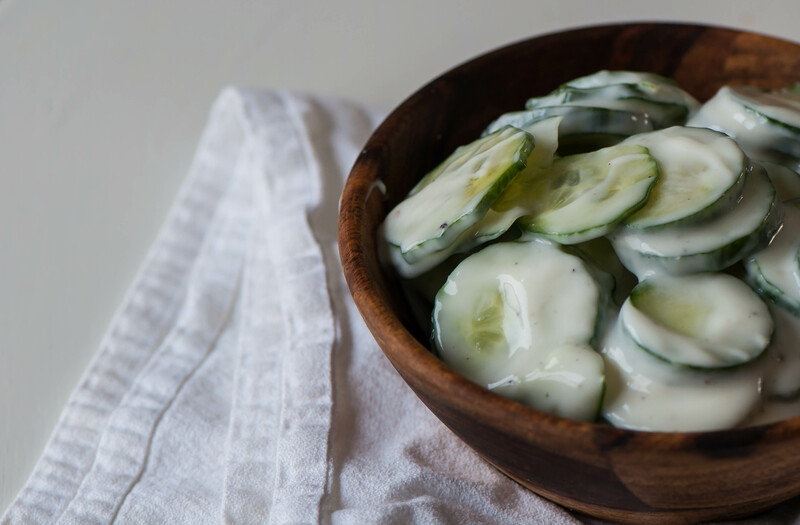 These cucumbers so light, crisp and refreshing you almost forget it feels like winter outside. Plus, it’s healthy and clean so you won’t have any guilt inhaling half of it. Have you guys been sticking to your New Years resolutions/goals? There are brownies in my house so it’s been hard to avoid them but I’m keeping on track. I even got up at 6:00 yesterday to go work out. My legs took longer to wake up so that was interesting. I talked about my resolutions last week and one was to choose a cuisine each month that I don’t have much or any experience cooking and dive in head first. I chose Indian for this month and I can’t say my family was super excited. Joel and I have never been huge fans of Indian food and the kids haven’t ever tried it. But I told them it was time to give it another chance. Noah has gotten so picky and I’m so over it. I’ve gotten so much more adventurous with my eating since starting the blog and I’m determined to have kids that will try new things along with me. Is throwing a bunch of new stuff at him the way to do it? Who know, but that’s what we’re going with here. I figured this recipe would be a safe first choice since it’s similar to cucumber salad which we love. Let me tell you, Noah ate this straight from the mixing bowl. And wanted it in his lunch the next day for school. I’m not too surprised he liked it since we eat cucumbers often but it definitely had more of a tang and a different acidic bite than our regular route. I love how healthy it is too. It’s perfect to go alongside a spicy main dish as it will help cool it down and cleanse your palate (if you’re fancy like that and use that phrase). Whisk together lemon juice, ground mustard, yogurt, salt and pepper. Stir in cucumber slices. Refrigerate until ready to eat (I think it's better the day after).